Cecilia Samartin's debut novel is rich with a love of sea and sand. The sweet idyllic life of childhood sweeps the reader into the poetic writing and magical world of houses with windows facing the sea. The scents of sea breezes mingle with the taste of fresh guavas as two cousins emerge from their long summer to face a life of political turmoil. Alicia's romantic heart leads her to love and to remain in her country, while Nora escapes the conflict and struggles to find a new home in America. This meditation on the loss of home and the longings for lost innocence makes this a book of salt water and tears. 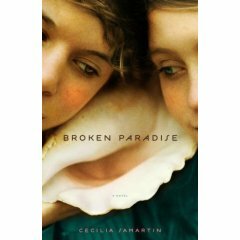 Cecilia Samartin's impressive powers of description invite you into an intimacy where small pleasures and secrets cross the waters in letters and one woman must sell her body while the other is determined to keep her soul. Broken Paradise is a completely captivating journey into the heart of longing. Poetry weaves itself through Adam Plack's sensual music in passionate whispers and fantasy worlds of past lives and future invitations. Unrequited love becomes rain with pattering feet and smiles of autumn. The lover, while mortal, becomes the world in her absence. Visions of beauty, romance and passion create an world of mystery and exotic moods. Poetry escapes from pages and breathes through sweet vocal interpretations. Ancient echoes, jazzy escapes and electronic tribal fusion awakens a soul intoxication in "When I Kiss." Deepak read many translations of Rabindranath Tagore's poems and then translated the poetry for our generation. The results are stunning in beauty. Deepak Chopra, Sinead O'Connor, Angelica Houston, Antonio Banderas, Marisa Tomei, Lisa Bonet, Milla Jovovich, Shekhar Kapur, Gina Gershon, Melanie Griffith, Jared Harris and Claued Challe mingle their voices with music. If you have read Rabindranath Tagore's poems I think you will be impressed with these new translations. I remember the first time I read one of his poems and the experience was an awakening to poetic wonder. Within these poems, you may find yourself wandering in India, Africa or Spain. You may become lost walking across clouds or seduced into the pleasures of the invisible. to buy your heart with gifts"
If you are a hopeless romantic, this musical journey with poetry will make you heady. If you love creating moods, this is perfect while taking a bath by candlelight. I'd highly recommend something like "Dream On" from Lush and perhaps the Flying Fox shower gel and an application of Flying Fox Jasmine temple balm. This CD whispers: "Play me in the dark with the flicker of at least 4 beautifully scented champaca candles." I can recommend the Ergo Champa candle or the Ergo Passion Rose de Mai. The poems presented here seduce with soul longings and entangle you in magical stories of love. The entire CD is breathlessly beautiful and a true gift of love to anyone willing to spend the time diving deep into this mystery. I can also highly recommend Deepak's book: "The Soul In Love." "Say your last words in silence..."
FOR LOVE OR COUNTRY is based on the true story of Arturo Sandoval who finally cooperates with the Cuban government and even joins the communist party in order to have the freedom to travel internationally. He was living in a country where there was no respect for human rights, let alone freedom of expression in music. Arturo Sandoval is one of the most brilliant musicians of our time and is known as a protégé of the great Dizzy Gillespie. He was born in Artemisa on November 6, 1949. Artemisa is a small town on the outskirts of Havana, Cuba. He realized he was a trumpet player when he was eleven. He began studying classical trumpet at the age of twelve. He is now known as one of the world's most acknowledged guardians of jazz trumpet and flugelhorn. As a Professor, Sandoval has lectured internationally. Filled with a virtuoso capability, he had an intense desire to share his musical gift with those who share the same love for music. Arturo Sandoval appears on the tracks “Moonglow” and “That Old Feeling” in Rod Stewart’s release “It Had to Be You: The Great American Songbook.” His diverse style can be heard on albums like Gloria Estefan's “Into the Light.” He also has made a contribution on albums by Johnny Mathis, Frank Sinatra and Paul Anka. "When the idea for the movie came up, I was happy to be able to tell my story, but even happier to write the film score," he says. "Music for movies has been my life's passion, and this was my first and biggest step in that direction........."
In the movie, Arturo (Cuban-American actor Andy García) is thinking about defecting when he meets Marianela (Mia Maestro). She becomes more important to him than freedom. Their beliefs are on the opposite sides of the political spectrum and yet their love binds them to one another as they try to overlook their political differences. Marianela represents family loyalty and the way people who live in Cuba really think. It shows how Marianela goes from being completely loyal to a dictator to having her eyes opened to the reality of the situation. She falls completely in love with this talented musician but fears he may leave her like her first husband. Arturo has also been married before and while he is willing to spend his entire life with Marianela, she has her doubts and issues with trust. She has been betrayed by the government she supported. This movie is at times so romantic. Especially the scene where Marianela and Arturo are dancing and when she wakes him up after he spends the night sleeping on a grave. The scene overlooking the ocean is so pristine. After performing with the Cuban Orchestra of Modern Music, he was allowed to start a group called Irakere that promoted a combination of Cuban music and jazz. In 1981 he then leaves Irakere to form his own band. He believes he has a gift to give the world and is fighting a force that threatened to drown his true love, music. After living with his wife in Cuba and starting a family, he decides it is time to leave. He believes that by defecting to the United States he is rejecting a system that kills confidence and personality. Rejecting a government that controls everything to the point that people lose their desire to achieve. The government finally tries to control Sandoval’s music and his dream for greater artistic expression. While on a European tour, he leaves for a secret meeting at the U.S. Embassy. Sandoval was granted political asylum in July 1990. Since his defection, Sandoval has increased his classical performances world wide including performances with the National Symphony, L.A. Philharmonic, National Symphony of Washington D.C. and Pittsburgh Symphony. Even Arturo says he would like to go back to visit his homeland, but under a different government. “Flight to Freedom” was his first recording immediately following his defection. An emotional movie about the desire to use your God-given talents without repression from those who don’t see beauty in the soul. This movie really is about having a dream and finding your true purpose in life. This is a movie about beauty and sadness with a happy ending. Life is truly a dream for those who are free and yet at times even if you are free, you can feel that you are in a prison of yourself. There are times when a person feels they have so much to give and they can’t find an outlet for their gift to the world. In such a case a person can at times risk everything for the freedom of expression and the freedom to grow as a person, as a soul. If you never follow your dreams, you might not be really free. A movie about Romance and Freedom everyone should see! Especially romantics and those who love Jazz. In my eternal search for poetry infused with images of water and passion, "On Entering the Sea" appeared on the Amazon horizon. How I love this site and the ability to locate life-enhancing selections of great beauty. The poetry of Nizar Qabbani requires atmosphere and an imagination willing to travel beyond the daily drudgery of existence into longings for home, passionate encounters and the mysteries of sensation. At times his poems have echoes of ancient works that intertwine themselves with modern complexity. His work celebrates the love of country, women and sensuous images of coffeehouses and Andalusian experiences. As an introduction to Nizar Qabbani, On Entering the Sea presents his work in a pleasing arrangement by translator. While the introduction by Salma Khadra Jayyusi presents an overview of the book, how I wished for a section at the end to explain the details behind many of the poems. Would this enhance my enjoyment or do the poems speak of moments so profound, no other explanation is needed? It could be said that many of his poems have a universal appeal and need no further explanation. By the end of the poem he talks about crystal bottles with dead butterflies and the images become revelations of eternal struggles for independence and for the freedom to love. During his teenage years, his sister committed suicide, because she could not marry the man she loved. Time after time Nizar Qabbani displays an exceptional understanding of what it means to be female all while revealing what it means to be a man. Insatiable physical love and ecstasy from the sheer vision of a woman become spiritual expressions of love for God himself. "The Book of Love" is worshipful and timeless. I wrote it on the water. That names dissolve in the water. He also asks: "What is Love?" Then he humorously explains how he cannot change the woman he loves for she is "a storm trapped in a bottle." Most of the poems are pleasing and passionate, but there are poems displaying private pain and horror as love is ripped from his hands by the ravages of terror. He perfectly describes his grief in an unusual moment where he is standing in the rubble of an attack and remembers his wife and the cadence of her name. As he finds her handbag in the rubble, we are convinced no man has ever loved his wife this deeply, and yet the universal message makes us realize how many have loved and lost and longed for a woman like Balquis Al-Rawi. The vision he paints of honey, jasmine moons, rubies and roses will remain in my memory for as long as I love poetry. As in many passionate poems, the feelings of the poet flowed through me and appeared in tears. His poem about his mother's death is equally poignant and we are left with the scent of coffee, cardamom seeds and orange blossom water. If you are a lover of world poetry, the poems of Nizar Qabbani are essential reading. Through his poems you feel the ancient longings of all people in all lands and in his uncensored thoughts, we can truly experience life through his eyes. I can only hope more of his work is translated in the near future. The exciting element of his poetry is often how he absorbs experience and then defeats his own inner tyranny by writing exactly what he thinks to display the beauty of truth. You will hear echoes in his writing and realize how many contemporary spiritual teachers and poets have been students of his poetry. In a past life I may have lived in a lighthouse or a tower, because my dream is to live in a tower type building with windows all around the top level. When I think of a lighthouse, I have rarely thought about the actual life of the people living at the lighthouse although I'm always dreaming about living in one. They look so isolated and lonely, but this book brings out an entirely new perspective. Recently I have been viewing documentaries on the subject of lighthouse restoration and this is an excellent companion to this new interest that seems to be calling to me. 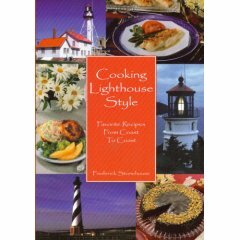 I have been dreaming about running away to a lighthouse and cooking delicious meals. This book is quite the inspiration and recipes like Ginger Bread Pancakes or Coffee Cake create atmosphere and a longing to eat pancakes by the sea. One of the lighthouses comes complete with resident ghosts, another looks like a quaint little stone house with an added light at the top. The Granite Island Lighthouse is absolutely delightful and now the light has been automated as is the case in most lighthouses in modern life. There is a double lighthouse in Atlantic Highlands, New Jersey that looks like a castle or at least a fortress. 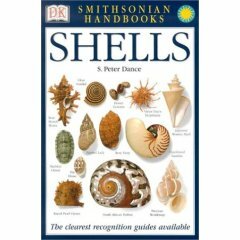 This book made me nostalgic as if I am longing for simpler times and more time to make foods born of the bounty of the sea and surrounding lands. Information about B&Bs in Maine and stories about the lighthouses are a bonus. Each recipe is accompanied by a story and that makes this book memorable and collectible. 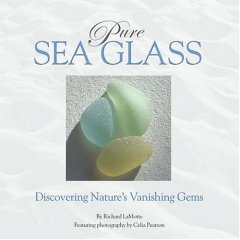 Listening to this CD, reading poetry and soaking in an essential oil/sea salt bath is a weekly indulgence. 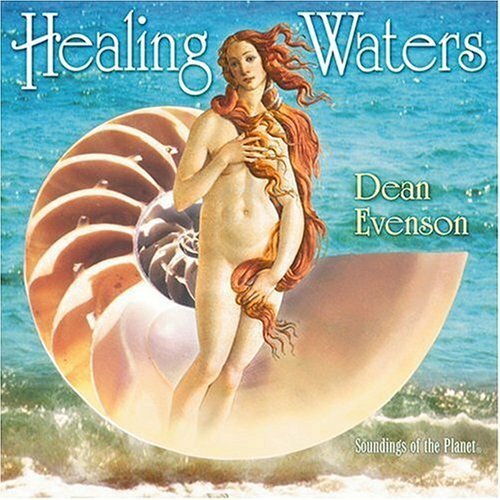 I love the water sounds in Healing Waters and this CD always induces a deep state of relaxation. There are ocean waves, lush flutes, dreamy harps and flowing rivers. I love the way the waves sound and the way the flutes create a magical environment. Sometime I fall asleep at night listening to this CD and imagine I'm in an underwater bubble with fish swimming all around. I have seen shows where they have underwater hotels like this, but so far I've only visited in my imagination. For a deeper relaxation experience, use headphones and get into a warm comfy bed. If you fall in love with this CD, also look for music by Tom Barabas, Scott Huckabay, Singh Kaur, Daniel Paul and Sunyata.